It’s not often that all of Adventure Film Collective get to come together on a single project but we did recently on a new production for Bear Grylls called ‘Breaking Point’. In this series Bear takes everyday people with a fear or phobia on a personal journey to face their demons. We got to shoot in some amazing locations from jungles in Mexico to the magnificent mountain ranges in the Italian Dolomites. My job as director @nickomeally was to keep the show on the road / cave / cliff face and ensure that we returned to London with compelling stories and stunning visuals. Keeping up with Bear and the participants in some extreme locations and torrential downpours was never going to be easy but we pulled it off largely because of the skill set of the team working behind the scenes. Adventure Film Collective’s Stani and Meg got a small army of us in and out of some pretty hairy locations from heli drops onto exposed mountain ledges, to river crossings deep in the Mexican jungle. Capturing everything on camera, while trying not to fall off the side of a cliff were DOP’s Dan and Ossian assisted by Jim. Not forgetting sound recordist Pete Lee, lurking in the background hoovering up sound. 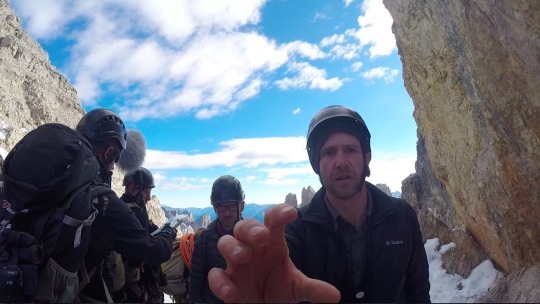 Here’s a go-pro eye view of Danny Etheridge checking his frame mid-climb/shoot in the Dolomites.